Hunza is located in Gilgit Baltistan, almost 560Km away from Islamabad via Naran-Babusir Top and 620km away via Besham-Dasu-Chilas. Its takes 13 hours and 15 hours from islamabad from both routes consecutively. While you travel to Hunza, there are numerous breathtaking spots including 3M, Riakot, Babusir Top, Gilgit. Once you reached at Hunza, must visit following spots. 1. Rakaposhi View While traveling towards Hunza from Gilgit, after an hour of driving, on the left side of the road, one can see breath taking view of Rakaposhi. There is hotel and restaurant available for tourists. 2. Aliabad Village Aliabad village is located just 20mins of drive before Kareemabad Village. Gardens of dry fruit are major attraction of the town. 3. Karimabad Village Kareemabad village is the main town in Hunza, where you can see traditional culture of locals, their wearing, home structure and their lifestyle will attract you. 4. Altit Fort: Altit fort is one of the must visit places in Hunza Kareemabad Village, its royal garden, local traditional restaurant, awesome view from the fort will be worth visiting. 5. Baltit Fort Baltit Fort is also historic and architectural beauty situated in Karimabad Village. Ancient Fort was built in 8th CE and now enlisted in UNESCO World Heritage Tentative list. 6. Eagle's Nest If you visited Hunza and did not visit Duikar Village, then you missed the tour's major attraction. 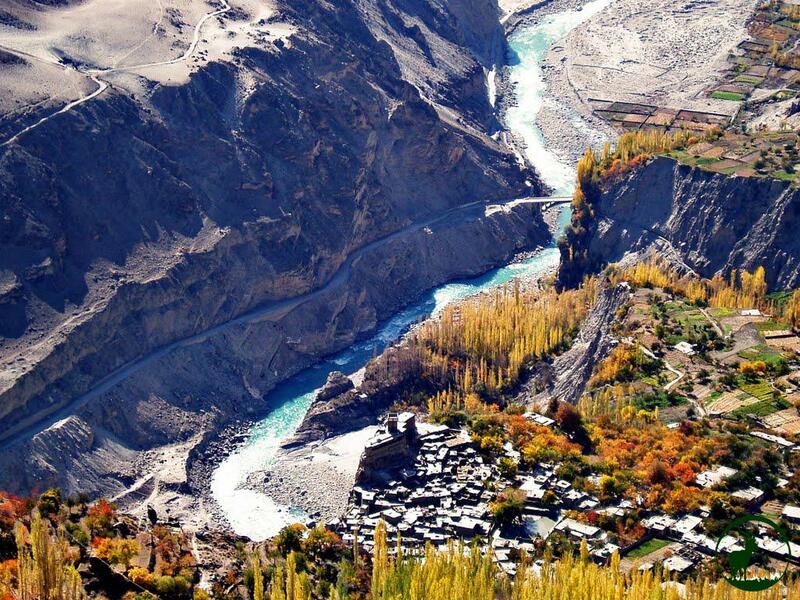 One can witness the beauty and Panoramic View of Hunza from Duikar Village, that is why it is called Eagle's Nest. 7. Attabad lake Attabad Lake is must visit place in Hunza, plenty of tourists visit Hunza and enjoy boating at Hunza Attabad Lake. Attabad Lake is situated on just 45 mins of drive from Kareemabad (Altit Fort). 8. Sost Sost is also read is Sust is located in Gojal Valley (Upper Hunza). Sost is used a base camp for visiting Khunjerab China border. There are many standard hotels available for night stay. Distance between Khunjerab and Sost is almost 87km and from Hunza to Sost the distance is 90km. 9. Passu Cones Passu is just 50km away from Hunza, located in Upper Hunza Gojal Valley, 15km away from Gulmit. Cones shaped mountains in Passu making it worth staying and worth visiting. There are limited but better hotels options are available in Passu. 10. Khunjerab Top (China Border). Khunjerab Top a.k.a China Border is the last destination of Karakorum highway in GB. It is 180km away from Hunza and 87km away from Sost. Many people from across the Pakistan visit GB just to visit Khunjerab Top.